On September 22, 2005, three weary Wolf Pups arrived at their new home. 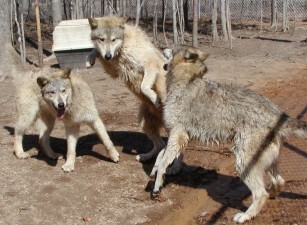 After a long truck ride from an Animal Preserve in Ohio, where they were bred and born, the trio came to Wolf Howl Animal Preserve in Etta, Mississippi. They are a mixture of two different sub-species of the Gray Wolf, Canis lupus lycaon, Timberwolf and Canis lupus arctos, Arctic Wolf. Canis lupus lycaon historical range was southeastern Canada and the northeastern United States. Canis lupus arctos can be found in most of the Canadian Arctic Islands and Greenland. On September 29, 2005, we named the pups. We chose names that we feel fits their present personalities. 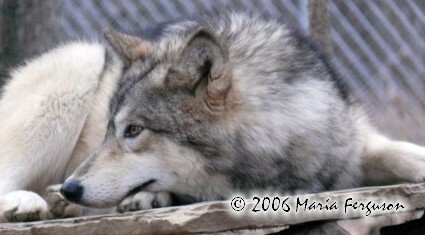 The spring of 2007 brought us 4 more Wolf pups who were born and socialized at the Preserve. Wa-Ta-Chee was born on March 28, 2005 at the animal preserve in Ohio. His parents were Lobo and Sleet. He is Waya's brother. 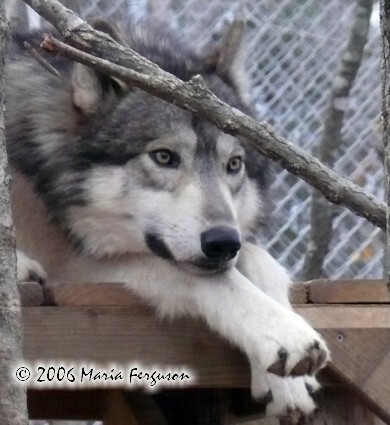 He was the largest of the three Wolf pups that came to our Preserve in the Fall of 2005. Wa-Ta-Chee was a very bold Wolf until he took over the position of Alpha in the pack. He then became much more reserved and watchful. As Alpha Male, you could clearly see that he had the welfare of the pack in mind. He loves to come to his caretakers for petting and scratching. He was the first of the original three Wolf pups to give his caretaker, Maria Ferguson, a kiss. Wa-Ta-Chee is very inquisitive and loves anything to do with water. He took a bath in the automatic watering system the second day he was here. He also disassembled the automatic watering system on the third day after his arrival. Thanks to Wa-Ta-Chee, the Wolves are drinking the old fashioned way, with water buckets hung on the fencing! We picked his name because it means "meeting at the waters of talking spirits". We figured he had to have some spirit help taking apart the water system so quickly! Watachee was the first Wolf to start howling even though Waya didn't want him to. When Wa-ta-chee took over as Alpha of the pack they all began howling together. The pack had been strengthened. 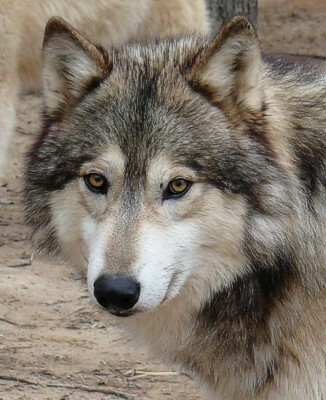 Wa-ta-chee became a Wolf Papa in the spring of 2007 to four beautiful Wolf pups. He was the best Wolf Dad and Alpha I have ever seen. His position as Alpha was taken over by his daughter Chito in the 2012 breeding season. He remained with the pack in a subordinate position until he passed away in the fall of 2018. Listen to their song! We've added in July of 2008, a gallery of Wolf pictures just for Wa-ta-chee, click here to view them. Here is a beautiful video tribute to our former Alpha Male and our sweet, shy, large Wolf, Wa-ta-chee. In Memory of Wa-ta-chee. 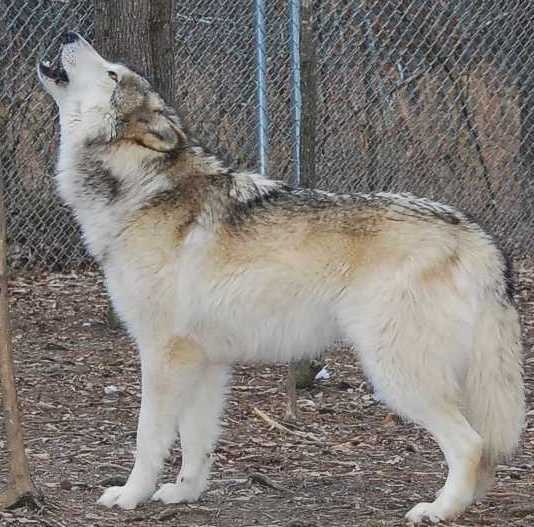 Waya was born March 28, 2005 in Ohio to his parents, Lobo, an Eastern Timber Wolf (Canis Lupus Lycaon) and Sleet, an Arctic Wolf (Canis Lupus Arctos). We were told that he was Alpha of the three Wolf pups. There were some things that lead us to believe he was as well. In November of 2006, Waya stepped down as Alpha when he was challenged by his brother, Wa-ta-chee. He accepted his new position in the pack graciously and has been much more relaxed with his caretakers since. 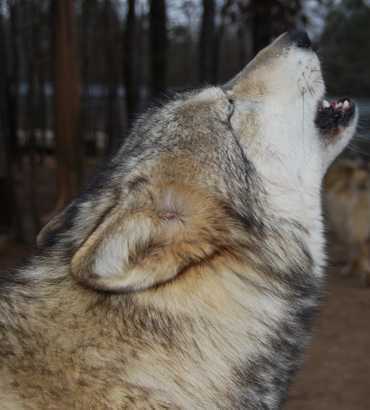 He is currently starting chorus howls which is a big deal for a Wolf that didn't want the pack to howl. We also know, that he is a very good example of just how shy and reserved a Wolf can be. He was taken from his Mother at 13 days old and bottled fed by multiple people. He is a strikingly large and good looking Wolf. He has a long slightly crooked muzzle, long legs and a beautiful coat. He loves to be pet, stroke and scratched by his caretaker, Maria Ferguson. He rubs up against his caretaker like a cat for more. There is a gentleness and kindness about him. We selected his name, Waya, because it means "Wolf" in the Cherokee language. 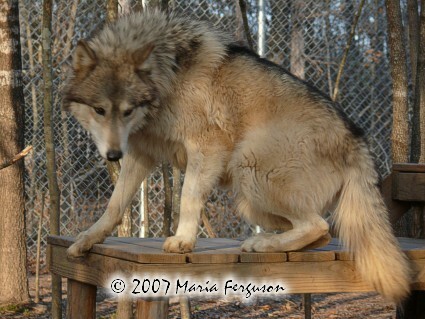 Waya was excited about the birth of four Wolf pups at the Preserve in the spring of 2007. He was given the position of Wolf Nanny and teacher for them. He did a wonderful job. He is in every way a fine example of a Wolf. In July of 2008, we gave Waya his own Wolf pictures gallery. Waya suffered a brain tumor at the age of 10 and left this earth in November of 2015. Here is the Memorial Tribute to Waya. 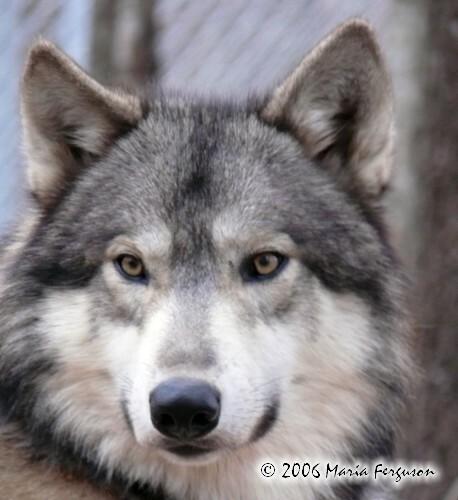 Ohoyo was our Alpha Female who gave birth to four wonderful Wolf pups in the spring of 2007. In the Fall of 2010 she was retired from this position in the pack. Her daughters led by Woha challenged her position. She is a very small Wolf with huge feet. Ohoyo is very outgoing and loves to be paid attention to. In fact, she is quite demanding about it. She doesn't like to share her caretaker's attentions with others. She submits for belly rubs and comes right to the fence to see visitors. Ohoyo is the Choctaw word for "Wise Woman". We felt she deserved the title, since she once knew just how to keep her male packmates in line. Ohoyo can always bring a smile to her caretakers faces. She flirts with male visitors, chuffs and howls at people she doesn't particularly care for and loves to give big sloppy wet Wolf kisses to her caretaker. This is a Wolf with a sense of humor. As of July of 2008, Ohoyo has her own Wolf pictures section in our gallery. Check it out. Ohoyo passed away in her sleep on December 29, 2018. Her is a link to her memorial page, In Memory of Ohoyo 2005 - 2018. 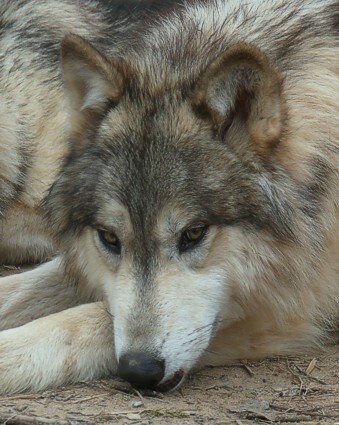 Niko Akni was the only male in the 2007 litter. We named him Niko Akni pronounced (nee-ko a-kin-ee). Niko after the Siberian Huskie that was the inspiration for our Wolf Preserve and Akni is a Choctaw word for first born. He was the smallest of the litter but is now the largest Wolf in the WHAP pack. He was very leery of partaking in the formula out of the bottle and was the last one to eat. He put his head and neck over his Sisters and gives them a toothless nip on the neck. He was also the first Wolf pup to howl. Niko Akni had a rough start but has survived and thrived. Niko took over the Beta position in the pack while his Father, Wa-ta-chee was still Alpha. He continues to hold that position but now it is also shared by Woha. He is absolutely wonderful with caretakers, gentle and loving. To view more Niko Akni pictures, click here. Sadly Niko developed cancer and we made the hard choice to help him over the bridge in the fall of 2018. He was the sweetest boy and we are missing him so much. Here is our tribute to Niko Akni. Woha means howl in the Choctaw language. We named this little female that because she just hummed when she took her bottle. She was the smallest female Wolf pup when she was pulled from the den. She is an absolute delight to watch. She howls, sleeps on her back with her legs in the air, crawls onto her caretakers laps and is very independent. We had a mattress down on the floor in the nursery for the Wolf Nannies and she actually pulled herself up on it at 10 days old. I think that Woha will be a real personality to watch in this pack. Woha has a very dominant personality and was showing signs of a possible Alpha Female. She in fact went for that position during the 2010 breeding season but failed and Chito became the dominant female. 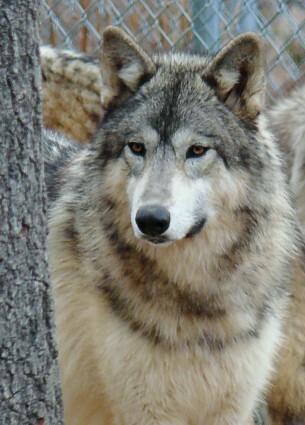 As of the 2012 breeding season she has held the Beta Female position in the pack. She is very good with her caretakers and has a fun loving spirit. She loves to howl and is very good at it. She is the soprano of the pack. 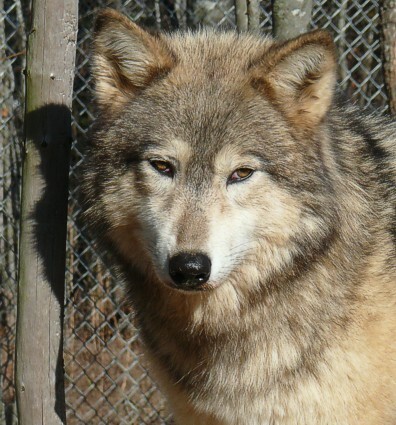 If you would like to see more of Woha, visit her Wolf pictures gallery. Chito pronounced (chay-toe) means enormous in the Choctaw language. She is that indeed. She was pulled from the den at 8 days old and weighed nearly 3 lbs. She was always the first one we fed as she was ravenously hungry. She was the first one to open her eyes at 10 days of age. She explores everything and everywhere when given the opportunity. Chito became the new Alpha Female in the winter of 2010/2011 after her Sister Woha initiated a takeover of the former Alpha Female, Ohoyo. 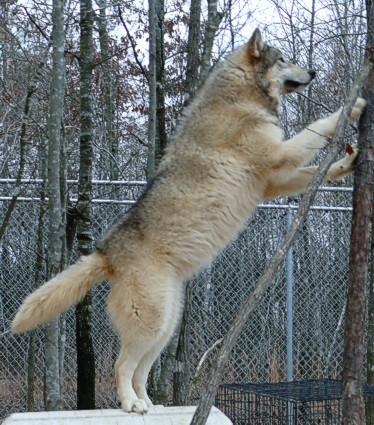 In the winter of 2011/2012 she took over Wa-ta-chee's position as Alpha and is now the sole Leader of this pack. She is an absolutely delightful Wolf who loves to play but is very reserved with people she doesn't know well. Out of all the Wolves, Chito truly loves to howl the most. Her caretakers can always get her to produce a song. Want to see a picture of Chito, howling? Then click on her picture gallery. Chito passed away unexpectedly in the summer of 2017. The pack has not been the same without her strong leadership. We would like to share with you our video tribute to this big, beautiful Wolf girl. In Memory of Chito. Meet Nita pronounced (needa). In the Choctaw language the name means bear. That is what she looked like a darling little bear cub with her black muzzle when she was pulled from the den. She is a very laid back Wolf pup. She was content to sit in her caretakers arms when she was done drinking her bottle. She was darling to watch as she waddled around trying to climb on chairs and up the cabinets. Nita is now the smallest Wolf in the pack. In the winter of 2010/2011, this former Omega bettered her position in the pack. Unfortunately, as of the Fall of 2011 she has once again assumed the position of Omega Wolf of the pack. She is quite the little firecracker. She loves to play and is usually the first Wolf to initiate a game. If you would like to see more of our darling little Wolf, Nita, check out her Wolf pictures gallery. Our sweet little Wolf girl left this earth too soon for all of us. She suffered from seizures that eventually ended her life. The pack was never the same again. Here is our video tribute to our precious Nita, In Memory of Nita. When push comes to shove, these Wolves are all in it together. 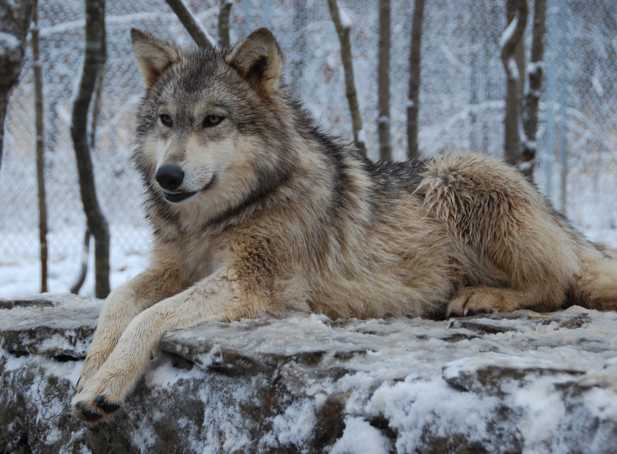 The Wolf pups are now considered adults as they have reached sexual maturity in the winter of 2009. They are doing great and bonding nicely with their caretaker. They enjoy basketball, playing with their "extra-heavy duty Kongs", chasing sticks, taking dunks in their tubs, belly rubs, scrathes, attention, food and a good game of chase. 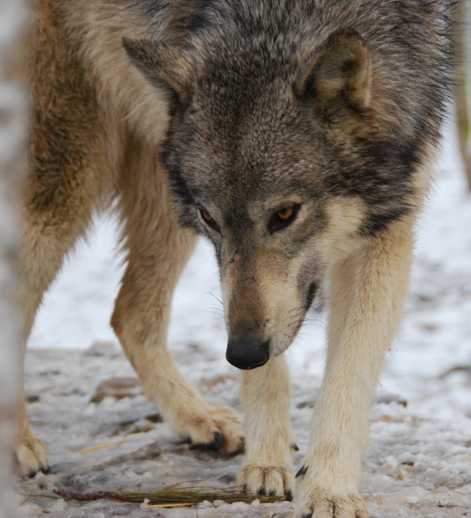 For the latest pictures of wolves, visit Wolf pictures - Winter 2009 or for hundreds of cool pictures of our Wolves look in the categories at our Wolf Pictures Gallery.